Frost Extreme Chassis Black is de ideale lak voor chassis, sub frame en wielophanging componenten. Beschermd tegen vuil, chemicalién en UV. Bestand tegen temperaturen tot 150 gr. Celcius. Chassis - alle vet en vuil grondig verwijderen. Oude laklagen zo mogelijk schuren en nareinigen met C110 Frost Panel Clean. Kan aangebracht worden op blank metaal, echter voor optimale hechting breng aan over P270 Frost grey Primer. while giving better protection from road dirt and harsh chemicals. 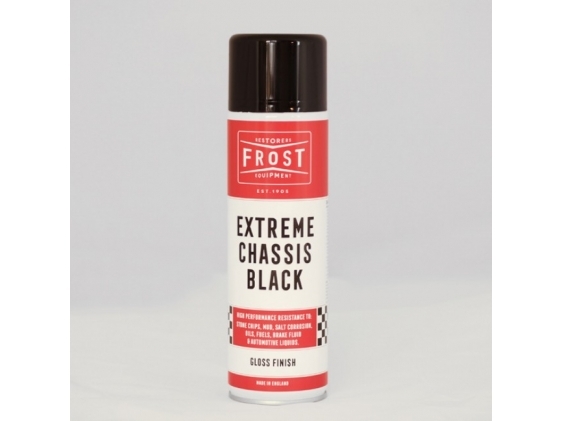 Frost Extreme Chassis Black offers excellent UV protection and will withstand temperatures up to 150°C. The formula can be applied direct to bare metal. Ascertain suitability over etch primer using a small test area. Aerosol 500ml - Covers 6 -7 sq ft.
* This is not HIGH GLOSS finish. 1. Surface must be clean and dry before painting. Use Frost Chassis Clean (C265) to remove heavy deposits of grease and oil, followed by Frost Panel Cleaner (C110) for surface cleaning. Can be used over bare metal, but to increase adhesion and durability paint over Frost Grey Primer (P270) or similar. Ascertain suitability over etch primer using a small test area. For best results, use at temperatures between 20 to 30 deg C and when humidity is less than 50%. 2. Wait 4 hours (Lightly rub down the surface after 36 hours) and topcoat with Frost Extreme Chassis Black. 3. Shake can vigorously for at least one minute before use and then again between each coat. Spray surface with steady, even strokes at a distance of 8-10 inches. Several light coats give a better finish than one heavy coat. 4. Apply enough paint to achieve full covering. 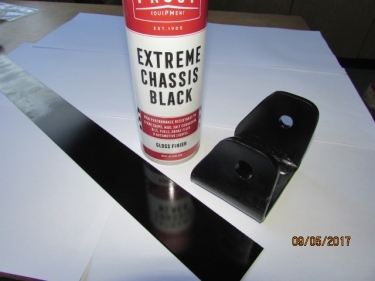 For best results, apply a maximum of two coats of Primer and two coats Frost Extreme Chassis Black. 5. If the spray button becomes clogged, remove to nozzle and wipe off the orifice with thinners. 6. Once the desired finish is achieved, allow it to dry for a minimum of 4 hours before use, it cures fully in 12-24 hours. Pressurised container: protect from sunlight and do not expose to temperatures exceeding 50 deg. C.
Do not spray on a nacked flame or any incandescent material.